Having a dialogue with people when they first join an organisation is very important and this is equally very true for Healthcare students. 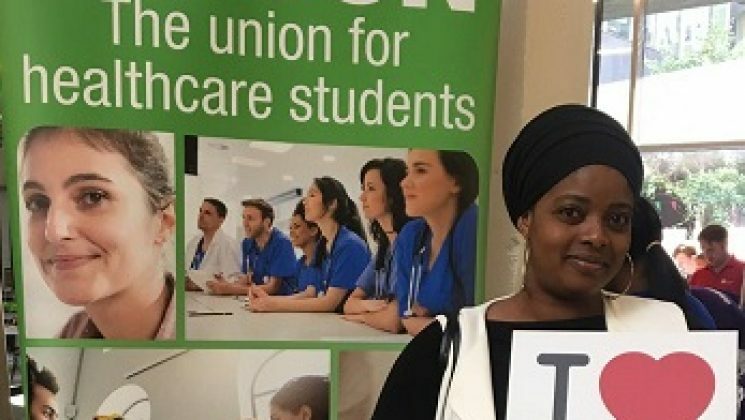 UNISON mostly recruits student nurses but this year has also seen Radiographers, Occupational Therapists, Midwives, Social Workers, ODPs and Physiotherapists join our union. Until August 2017, Healthcare students received a bursary in recognition of their working 50% of their three years training on the wards. This has now been taken away and replaced by student loans. This has had a detrimental effect on people signing up to train – both in numbers and the age of the students. The number of mature students has greatly reduced, whether it is those looking to build on their experience and knowledge as Health Care Assistants, those looking to start second careers and others returning to work after bringing up families. UNISON continues to campaign to bring back the bursary. Now, more than ever, these students need the support of a trade union when working on the wards. This year Organisers from Greater London recruited 1138 Healthcare students over 14 events – three in the spring and the remaining 11 in September (a very busy time). We have surpassed last year’s recruitment numbers which reflects everyone’s tremendous hard work – an increase of 11.3%! When we work together, we achieve great results. We talk to and engage with students and spend time with them explaining the benefits of Trade Union and UNISON membership. For those who have just left school or 6th form college, this can often be the first time that they have been invited to join a union. For many mature students, they have previously been with UNISON and they know the benefit of continuing to be a member of the UK’s largest trade union. Student membership costs just £10 per year for all the benefits of full membership.